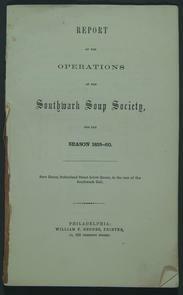 Title page of Southwark Soup Society report, 1859-60. "Operations of the Southwark Soup Society, for the season 1859-60. Soup House, Sutherland [Hancock] Street below Queen, in the rear of Southwark Hall." Printed by William F. Geddes, 320 Chestnut St.